Colloquium – an IIM Ranchi initiative, where its students get an opportunity to interact with the industry leaders in finance, marketing, operations and HR, has rolled into its 3rd year and its momentum is up and gaining. This year the Colloquium series at IIM Ranchi started with the insightful lecture from Mr.Pankaj Phatarphod, Managing Director of RBS India. He gave his valuable insights about the banking industry, the way it functions and its role in the development of India. Later the students interacted with industry leaders from firms like 3M, Alphom, Barclays ,Becton Dickinson, Bristlecone, Cisco ,DelCure Lifescienes, General Mills, JRG International, Kimberley Clark Lever, Minda group, OD Consultants, Relaxo Foot wears, Wells Fargo Bank and World Bank to name a few. The rich diversity of the domains represented by the speakers of Colloquium-2013 exposed the students of IIM Ranchi to varied industrial scenarios, which would further enable them to decide the field of expertise, marketing, finance, operations or HR, in which they should channel their efforts of exploration and understanding. Apart from gaining industrial insights, the students also discussed various contemporary issues faced by India and their probable solutions. In an interactive session with Mr. Onno Ruhl, Country Director, India, World Bank, the students came to know about the key indicators that would differentiate the states on economic standards and understand the urgent need of inclusive growth for the development of India as a country. The industry leaders shared their personal experiences with the students. They discussed about their achievements in life, and the path that they treaded to reach their current position. They also shared their failures and how such experiences have helped them face tough situations and problems in methodical and organized ways. 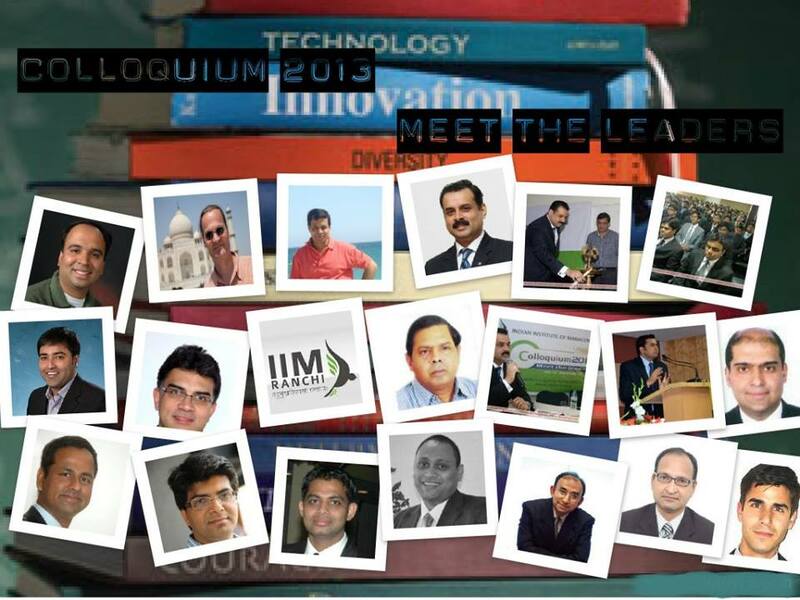 Thus Colloquium-2013 was an enriching and vicarious experience for the students. The interaction with the industry leaders would help the students develop a clear business understanding and gather required arsenal of domain knowledge and soft skills as demanded by the current dynamic industrial scenario.